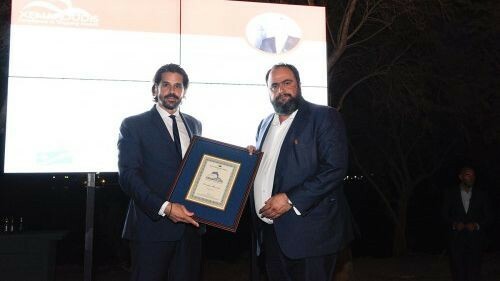 At this year's Posidonia conference, the chairman of Capital Maritime & Trading Corporation, Evangelos Marinakis, received the first ever “Xenakoudis Excellence in Shipping Award” from International Registries Incorporated (IRI), the administrator of the ship registry for the Republic of the Marshall Islands (RMI). Mr. Marinakis was commended for his ongoing commitment to upholding outstanding values in the shipping industry. The award was presented at RMI's reception on June 9, 2016 at the Ble Azure Club. Evangelos Marinakis is the founder and chairman of Capital Maritime & Trading and Capital Ship Management (together known as Capital). Capital manages a diverse fleet of 60 vessels, including the ships of NASDAQ-listed Capital Product Partners. Marinakis has more than 25 years of experience in shipping and capital markets, including two IPOs, and was the architect of Capital's diversification from a dry bulk company into a product, crude tanker and container ship company. He is also an elected member of the Piraeus municipal council and the owner of the Olympiacos football team. In presenting the award, IRI noted that two of Capital's ships had been involved in major rescue operations in Mediterranean waters in recent years: the tanker Arionas rescued 160 migrants in 2014 and the Agisilaos rescued 220 in 2015. Capital has also won the GREEN4SEA Excellence Award 2016 for its environmental excellence, energy management strategy and safety performance.